Continue by entering your HomeOwnerID/Account/Unit number. 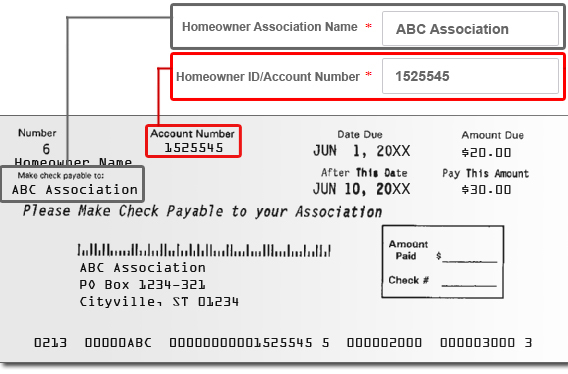 This number identifes the property you are paying for and can be located on your coupon or statement which is assigned by your Management Company. Refer to the sample coupon, to the right, or contact your Management Company if you are unable to locate. Is this your property below? We can't seem to locate the HomeOwner ID / Account / Unit Number for " "
No association found, please check spelling and try again. Note: If the savings and checking routing and account numbers are the same your payment will default to the checking account for payment. For savings, credit union, money market and business accounts, please check with your financial institution to verify the correct numbers to use for electronic transfers.